Since 1980, the Palamati Familly manages the Beach and Restaurant « Les Pirates » . Nestled in the Pine Park, Les Pirates private beach is ideally situated in the Bay of Juan les Pins, at the entry of the city center and the beginning of the Cap d’Antibes. 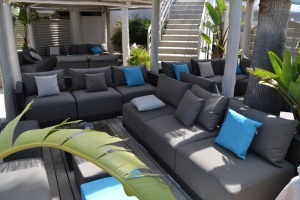 This exceptionally situated place welcomes all year long up to 180 sitting guests, (up to 500 persons with adding an outside extension), 800 guests in cocktail reception. Its total surface of 1000m² includes a long sand beach, wood deck pontoon and solarium, a veranda with a removable roof, and an inside space for cocktails and dance floor. The Restaurant is open every day for lunch from February to October included, Dinner in summer only. Captain Alain Palamiti manages his crew if 17 persons, on the deck and in the cuisine, with Chef Anna Palmiti, “la Mamma”. All stay at your disposal to organize your “taylor made” Event, according to your expectations. The restaurant is open from the beginning of February until end of october. 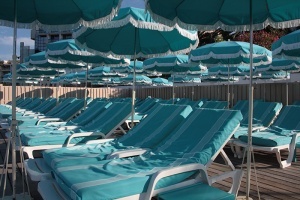 With 400 sunbeds in season divided on the two piers, the solarium and the sand , so approximately 2000 sqm. For your security a lifeguard is still on the beach. The beach attendants guarantee the catering on sunbeds.